Getting you out of the coulda-shoulda-woulda mode is Paul's first stop with you on your road. At this bankruptcy law firm, Paul's 25-year career is dedicated to people like you - people who have found themselves in economic crisis. When you call for a San Diego bankruptcy attorney free consultation, you'll be on track to get a clear, realistic understanding of your financials. You can then determine what works best for you. There really are answers - you just need to ask the questions. Is Paul The Best Bankruptcy Lawyer in San Diego? That depends on what's most important to you. If you're looking for someone who will know you and the details of your case inside and out, answer his own phone when you call him and guarantee the result he's predicted in your case, Paul is your best bet. He'll be the first to admit he doesn't - and doesn't want to - manage a bunch of other lawyers and paralegals, hoping no one misses an important detail. He is candid with his clients and, these days, delegates absolutely nothing. 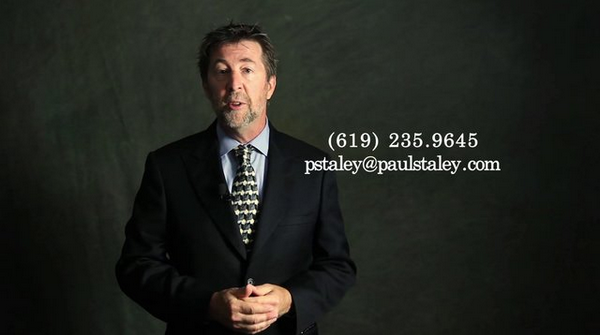 Paul Staley is the first bankruptcy lawyer in San Diego that guaranteed our work. That means if you file bankruptcy with Paul you can count on the results. If you want to know more about our results read our " Bankruptcy True Stories. " 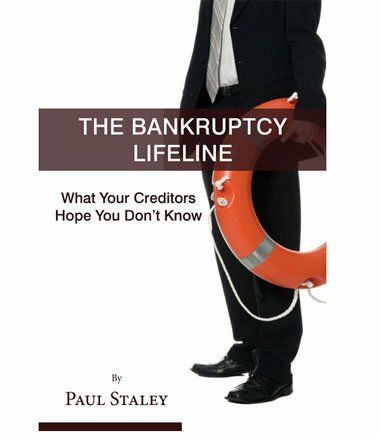 You can also go to Amazon.com and find the book "The Bankruptcy Lifeline", which was written by Paul. It is a free download. Paul understands it is difficult to talk to a stranger about your personal financial situation. Money is personal. If you want to get to know who Paul is before you call, stop and watch the videos. You will see he is transparent. This is his way of helping you understand your legal financial options. A Bankruptcy lawyer in San Diego you will call by his first name. Here in San Diego, Paul has helped more than two thousand people in file bankruptcy. He has helped single parents trying to get back on their feet as well as CEO's. He often says that he would've helped many more, but he is only one person. Large bankruptcy law firms churn out hundreds of cases every month, sometimes losing sight of people's unique needs. This San Diego bankruptcy lawyer is where you will not only get his personal attention to your concerns but also receive the professional service you deserve. Paul has taught at the joint meeting of the Bankruptcy and the Family Law sections of the San Diego County Bar, he relishes taking on bankruptcy cases that other San Diego bankruptcy lawyers will not work on because they are too complex. So... What is going to be your next step? “How do you feel?”, we hear the computer quiz Mr. Spock in a scene from Star Trek IV, The Voyage Home. The set up is familiar to fans of the TV series and the movies. Spock, unlike you and me, considers the question inexplicable, irrelevant. That’s because he is half Vulcan – a logic-based culture which disdains human emotion. But we are not Vulcan. So, why does it matter? Wait…Does it matter, you ask? I thought we were talking about bankruptcy, about San Diego bankruptcy lawyer(s). Oh, yes it does matter. Here’s why. I, as a San Diego bankruptcy lawyer, care about “How do you feel?” right now, as you begin gathering information. My reasons might seem odd to you at first. When a client arrives for her / his first meeting with me, a free bankruptcy consultation, it’s one of the first two questions I ask. It’s important because unlike Vulcans, we humans are not capable of separating our feelings from our functions. After over twenty-five years counseling clients, I’ve learned a thing or two about how feelings can help or hurt us when we are reacting to a threat. I’m not a doctor or a therapist, I realize. But I need to know you, know how you feel, in order to help you respond in the best way for you. Many clients contact me as a direct result of some specific peril facing them – foreclosure, lawsuit, wage garnishment, overwhelming medical bills. Let’s get you informed about the best way for you to respond, no matter how you feel. Knowing you have the information – and therefore the power – to face the threat will change how you feel about IT, and about yourself. Many of my clients begin their answer to “How do you feel?” overwhelmed with guilt, shame and regret. If you ever wondered about the quality of people who enlist me as the San Diego bankruptcy lawyer to file their bankruptcy, you should hear the heroic stories of herculean efforts clients make to avoid it. By the time a client (or couple) is sitting across the desk from me, they will have moved mountains. Crossed deserts. Climbed high, steep and dangerous mountains to forestall bankruptcy. Okay, I’ll stop with the metaphors. But you get the point. Picking up the phone to call their San Diego bankruptcy lawyer has to – for some – feel like the ultimate admission of failure. That’s why they go so far, work so hard to avoid it. Don’t let fear or shame control you. Don’t waste time second-guessing yourself about how you got “into this mess” in the first place. The only way I know of to fight fear of financial or legal problems is with information. And I have it. Knowing sooner rather than later the real truth about your financial situation is the key to reducing stress and moving forward. Some of those heroic, herculean feats my clients undertook before they called me were painful, costly and unnecessary. They so wanted to “do the right thing.” Some exhausted retirement accounts to stay current on a mortgage, only to lose the home later in foreclosure. Others took out lines of credit on homes to consolidate credit card debt on which they couldn’t – in my estimation – keep up payments. Still others deprived themselves and their families of necessities like medical insurance or a reliable car. Some even have foregone needed medical or dental treatment, or therapy and medication for mental health issues. Getting you out of the coulda-shoulda-woulda mode is Paul’s first stop with you on your road. At this bankruptcy law firm, Paul’s 25-year career is dedicated to people like you – people who have found themselves in economic crisis. When you call for a San Diego bankruptcy attorney free consultation, you’ll be on track to get a clear, realistic understanding of your financials. You can then determine what works best for you. There really are answers – you just need to ask the questions. That depends on what’s most important to you. If you’re looking for someone who will know you and the details of your case inside and out, answer his own phone when you call him and guarantee the result he’s predicted in your case, Paul is your best bet. He’ll be the first to admit he doesn’t – and doesn’t want to – manage a bunch of other lawyers and paralegals, hoping no one misses an important detail. He is candid with his clients and, these days, delegates absolutely nothing. Paul Staley is the first bankruptcy lawyer in San Diego that guaranteed our work. That means if you file bankruptcy with Paul you can count on the results. If you want to know more about our results read our ” Bankruptcy True Stories. “ You can also go to Amazon.com and find the book “The Bankruptcy Lifeline”, which was written by Paul. It is a free download. Here in San Diego, Paul has helped more than two thousand people in file bankruptcy. He has helped single parents trying to get back on their feet as well as CEO’s. He often says that he would’ve helped many more, but he is only one person. Large bankruptcy law firms churn out hundreds of cases every month, sometimes losing sight of people’s unique needs. This San Diego bankruptcy lawyer is where you will not only get his personal attention to your concerns but also receive the professional service you deserve.